Disruptive Innovation Talk: When not playing by the rules is a good thing! On Wednesday 17th of February the Smurfit MBA Thought Leadership Club hosted a talk on Disruptive Innovation to provide students a better view of current disruptive trends and how they shape the fourth industrial revolution that is arguably well underway. Three distinguished industry leaders addressed the audience: Bryan Hickson, Senior Manager, IT Advisory at EY, Kieran Harte, General Manager, Marketing at Uber, and Fintan McGovern, CEO, Firmwave (Smurfit Exec.MBA, 2012). They provided valuable insight on how they felt the industry was shaping up to the changing economic landscape, what they were doing to ensure their firms remained at the leading edge of the innovation curve, and what the future has in store. Two current students, Ciarán O’Shea (Exec.MBA 2017), and Sreekanth Nagabhushana (Full-time MBA 2016) welcomed speakers, hosted the evening, and facilitated a lively panel discussion and Q&A. Bryan Hickson from EY kicked things off by talking about cloud computing initiatives in his organisation and how the cloud was creating lean and agile software architecture, and compressing solution delivery lead-times from months to weeks. As a techie myself, I had expected Bryan to extol the virtues of cloud computing and how it is going to be the way of the future, I was pleasantly surprised to hear him provide a reasoned argument about how the cloud computing needs vary based on system and security requirements, and I wasn’t aware of the regulatory challenges associated with going ‘cloud only’. It is not often that I hear consultants provide such a balanced view without championing the current trend ruling the industry; Bryan’s impartiality really increased his credibility and the effectiveness of his talk. Kieran Harte told us the story about how two friends were able to turn a language barrier in a foreign city into a $60 billion business. His savvy and eloquent presentation about the origin of Uber in Paris, and the true purpose of Uber—to increase car utilisation from an average of 4%, and to ultimately make personal vehicles obsolete had the audience enthralled. Kieran claimed that Uber were not disrupting the taxi market, they were creating a more flexible public transport system, especially in markets with unreliable or undeveloped public transport services. He also pointed out that the shared economy business model will change the way people work and think about business, which was definitely a point to ponder for future executives and budding entrepreneurs in the audience. Our final speaker for the evening, Fintan McGovern is yet another success story from the Smurfit MBA. Having completed his MBA in 2012, Fintan spoke about globe-hopping post-MBA, including stops in Mozambique and St.Lucia before starting his own venture in Dublin. Today Firmwave is going strong and is growing from strength to strength in the ‘Internet of things’ space and shortening development by enabling rapid prototyping. Fintan spoke at length about his company’s vision and mission, and how by ‘sitting on the edge of cloud’ and engaging in ‘edge analytics’ they are helping clients increase their competitiveness. The talk was inspiring for students who want to beat their own path after completing their degrees. After the presentations guests engaged in a lively and interactive panel discussion and Q&A with an engaged audience. The impact of regulation was a recurring theme. Kieran spoke further about Uber’s plans for the future and regulatory challenges Uber has faced in Ireland, and about the looming threat posed to its service by copycats and driverless cars. Bryan spoke further about how organisations could leverage cloud computing technology to make software development a much faster and agile process. Ultimately, all speakers highlighted how strategies employed always placed the customer at the centre of solution development and delivery. We would like to thank all the speakers for taking out time and sharing their knowledge and opinions with us, and we hope the audience can apply some of the inspiring and motivating ideas in the future. On Tuesday 2nd of September, the MBA Programme Office were delighted to host a Celebrating Entrepreneurship Event in the Hibernian Club on St. Stephens Green in Dublin. After a brief introduction by Prof. Pat Gibbons, MBA alumni and current students were treated to some rare insights from Claire Lee, head of Corporate Venture at Silicon Valley Bank. This was followed by a soap-box challenge which involved a number of MBA alumni and students show-casing their start-up companies within a two minute time-frame. After a thoroughly enjoyable series of presentations, all present got the chance to mingle over a glass of wine. Below is a short synopsis of this showcase of innovation and something for our budding entrepreneurs to reflect on. On Friday September 5th, a number of MBA students, both past and present, attended Disruptors in The Marker Hotel. The one-day conference led with the tagline “Your industry is being disrupted. Are you ready?” With disruption seemingly inevitable, the conference aimed to highlight ways in which companies can be the disruptor instead of the disrupted. Thought leaders from around the world were brought together to share their unique and varied insights. Disruption is brought about through innovation, and it is the ability to innovate that was much debated throughout the MBA. As businesses become larger and more established, they tend to become less responsive to change, and therefore are at risk of disruption from more agile young companies. The speakers proposed many ways to stay ahead, including for example, the trend of creating startup incubation centres within large corporates to allow them stay close to the leading disruptive thinking in their industry. While the tips and thoughts throughout the day were helpful, the value of the conference was wrapped up in its core message. Either disrupt, or be disrupted. A special word of thanks to the organiser, John O’Loughlin (MBA 2012) for the opportunity to attend this conference. Congratulations to Ciara O’Brien of the EMBA Weekend year 2 class who won a €5,000 grant on March 27th from the inaugural competition for funds from the UCD Student Innovation Fund to assist with funding her Start-Up, “iSave”. Ciara’s winning pitch, iSave, is for a new online/mobile product which enables consumers to manage multiple savings targets via a single interface. The product is aimed specifically at the 18 – 35 demographic as these consumers have lost faith in mainstream banks and are looking for more contemporary, flexible ways to manage their finances. Working with the Credit Unions of Ireland, it was found that there is a significant opportunity to partner on this – they are looking for new ways to connect with younger savers, bringing their core values into a more contemporary setting. The UCD Student Innovation Grant will now be used to build a beta launch version of the product to share with a number of Credit Unions. The UCD Student Innovation Fund in partnership with UCD Students’ Union (SU) awarded a combined sum of €15,500 to student-run Start-Ups, as part of a new initiative by UCD to invest in student entrepreneurs. The panel of judges heard pitches from 33 Start-Ups in total and following delegation decided to allocate specific sums of funding to the ideas they felt deserved the backing. A special word of thanks to Bruce Martin who has been a key support to Ciara in winning this prize. Little Flappy Bird vs. giant Zynga Dog! Our MBA class just has come back from a great MBA International trip, “Doing Business in Emerging Market – China 2014”. In Beijing, we had an exciting morning visiting Zynga Inc., a giant social game company named in honor of Zynga, former CEO Mark Pincus’ late American bulldog, which transformed hundreds of millions of office people around the world to genuine farmers through a social game, Farmville and other popular games on Facebook such as Mafia Wars and Zynga poker. UCD China 2014 – Doing Business in Emerging Market. Recently, a tiny game – Flappy Bird – developed by the Vietnam-based developer Nguyen Ha Dong, became the special phenomenon in tech world when it climbed to the top 1st free application on both Google Android and Apple Store, a dream of even many giant technology companies which paid millions US dollars for marketing campaigns to get the top position in both Operating Systems (the author who writes this blog is also proud of being a Vietnamese guy who studies at the same technology university with Dong). While many people doubted that the top indie game Flappy Bird on Android and iOS Store can earn $ 50,000 a day, many top games have reached revenue of $ 1 billion. For example, the game Farmville has reached a revenue of $ 1 billion since early 2013 or the recent game, Clash of Clans, generates $ 2.4 million per day from Supercell Studio, a two-year-old start-up game company of Finland with only 95 members. It is quite normal in “the flat world”, a metaphor by Thomas L. Friedman in term of commerce for viewing the world as a place where all competitors have an equal opportunity. I believe that the metaphor is totally right for the mobile market where many developers have an equal chance to be successful from over the world even they are giant technology companies or dependent developers. During the meeting with the executive managers at Zynga, Flappy Bird story has been referred by my Indian classmate when he asked whether Zynga planned to make some tiny games like Flappy Bird. There are also some questions about ethical issues, i.e., many young people get addicted to the game, leading malnourished and neurological problems. The philosophical answer of the manager in Zynga quite met my moral perspective: “The addiction can happen to any field such as workaholic, alcoholic, Facebook-addicted etc… And individuals have a complete responsibility for their own actions but game developers should also limit time to play game”. Playing game in moderation is good for entertaining and socializing as Zynga stated their mission is “Connecting the World through Games”. This year, as part of the Global Network for Advanced Management, UCD Smurfit hosted a week-long module “Digital Marketing – Understanding Opportunities and Devising Strategies”. A cohort of around 25 MBA students from Fudan University School of Management, Technion-Israel Institute of Technology, IE Business School, EGADE Business School, Yale SOM, and UCD Smurfit met in Dublin, shared drinks and talked digital. Within one week, we were quickly, but comprehensively, taught the basics and nuances of the subject: how it works, the trends and future, and the quirks and twists. In a nutshell, search, social media, mobile connectivity, and web 2.0 skyrocket because they cater to a basic Homo sapien’s nature: freedom or in this case: the freedom to consume media whichever way is convenient. By establishing a seamless integration with web, social and mobile and communicating relevant messages, organisations can attract new prospects and retain their existing customers. Dublin – the digital capital of Europe – made a perfect backdrop for such a digital marketing marathon. Real-world study formed an integral part of the module. We were bussed to Facebook, Google, Hubspot, learned directly from senior marketing professionals, and marvelled at their stunning offices – or rather working playgrounds. These companies occupy different digital space: social media, search, and content with distinctive marketing approaches. All presentations boasted strong growth in digital marketing spending, notwithstanding the economic recession. To cap off the learnings, we worked on an actual marketing project for NewsTalk and presented our findings to the CEO and marketing manager. A Dublin experience would be incomplete without the vibrant Irish nightlife. We got to visit Guinness Storehouse, ate Irish lamb stew, and enjoyed the varied offerings of Irish beers and liquors accompanied by live Celtic music. The atmosphere was perfect to cool off a long day, share a laugh, and make friends. Many people planned to keep in touch, and see each other in the future. In our highly globalized world, the ability to develop networks and collaborate with others outside our comfort zone is more important than ever. The connections between leading business schools, companies and students were made possible by this opportunity. I would like to thank the companies, lecturers, organisers, and students who together made such an unforgettable experience. I’ve been meaning to write this post for ages. When I was in the middle of my MBA last year in Smurfit, there were some fellow students who viewed networking as a dirty word, something that makes you uncomfortable, an activity that is all about using other people to get what you want or to get ahead in some way. This is not networking. Yes, networking is about self-promotion and trying to get ahead but it is about so much more. Networking is meeting new people, hearing their stories, exchanging information and ideas. When you are a student this exchange is somewhat unbalanced because as a student you do not have as much to exchange. But guess what, the people you are talking to were also in your shoes at the start of their careers. And another truth is most that people want to help, to pay forward the help and advice they received at the start of their journeys. Personally I love networking. The reason is simple, I love talking, telling stories and I love meeting new people. I also happen to be trying to sell the MBA World Trophy to everyone who will listen. There’s nothing wrong with finding out who is going to be attending a function and thinking about what you would like to talk to them about. Doing this is showing that you respect other people’s time and understand that their time is valuable and they probably don’t want to be stuck talking to me for any length of time. Fundamentally networking is just an extension of selling. One of our speakers at the MBA World Trophy, Vivek Wadhwa wrote a fantastic article about the importance of networking that is well worth reading. If you are a student you should remember that no matter what job or situation you find yourself in you need to put forward the best version of you at all times. In another life I was a TV producer and my first boss in TV gave me great advice, when you arrive in someone’s house with a film crew you have a responsibility to ensure that you are remembered for the right reasons. Having a TV crew in your house is a highlight for the vast majority of ordinary people. So no matter what is going on in your own life, no matter how terrible you feel, you have to make sure you leave a positive impression. This has stuck with me and is something I try to achieve no matter where I go. I’m not always successful at it. The same thing applies to networking. Another important thing to mention is the power of LinkedIn. This is an awesome networking tool. Personally I believe you should always include a personal message when sending someone an invitation to join your network. Finally, and I’m not biased when I tell you that this year’s MBA World Trophy and StartUp Dublin will be like networking heaven. So if you are interested in the lineup please join us. We would love to meet you. Don’t immediately head for the corner after scoffing some free food/drink. It’s ok to be nervous/uncomfortable, 90% of the people in the room are feeling the same way. Try to find out who is attending in advance and find two people you would like to talk to about you. Don’t overcook talking to your targets. Get in and out quickly. You can always talk to them later that evening. Remember they more than likely have other people that they want to talk to. Always follow up with everyone you meet. Don’t take no for an answer, I’m not saying to be pushy, just get creative. And finally, my favourite. Every single person in the world will meet you for a coffee (except TV celebrities). Red: the MBA World Trophy Competition and the StartUp Dublin Innovation Conference takes place in Dublin 16-18 May 2013. One of the benefits that I find from the Executive MBA is that I go back to my day-job on a Monday morning and “noodle” on what we have discussed in class that previous weekend. I can bounce stuff off my workmates and get a different perspective on things to take back with me to class the following weekend. This is a very practical way of grounding my MBA experience into the everyday work-life on a continuous basis and creates a vital link between industry and academia. But in writing this blog, I began to wonder are there other less obvious opportunities for linking industry and academia? I have worked in start-up companies for the last 7 years of my life and if there is one thing that start-ups have in common it is the lack of money available and the requirement to achieve one’s aims with the smartest use of resources possible. Earlier in my career I spent 8 wonderful years in NUIG as an undergrad and postgrad and if there is one thing that universities have in common it is the abundance of engineering equipment available for testing, analysing and characterising materials,devices, structures, etc. etc. Surely it is logical to bridge the two and create a valuable and strategic symbiosis in the process? Of course there has been continuous links between industry and academia down through the years in the form of collaborative research partnerships, sponsored post-grads,etc. which have been hugely beneficial to all parties. Such endeavours keep third-level researchers relevant, allowing them to work on problems that are very current and applied. At the same time they have provided the sponsoring company with valuable research allowing them to develop technologies and create significant value for their products. On a routine basis, we (in our company) have need for short-term access to calibrated test equipment such as tensile testers, torque testers, fluid analysers, FTIR, DSC, etc. etc. and have had to contract this work out to third-party vendors. An opportunity exists for some of the third-level institutions to provide such services to industry and generate a valuable revenue stream in the process. Endeavours such as Metric Ireland and Connect 2013 are important drivers for fostering additional links between industry and academia so that short-term gains and benefits can be realised on both sides. Funding for third-level is being continually stretched and industry is constantly required to operate in ever-more-efficient means to achieve their goals. I believe a significant opportunity exists at present to align all relevant parties in pursuit of this and build sustainability of the indigenous sector into the future. 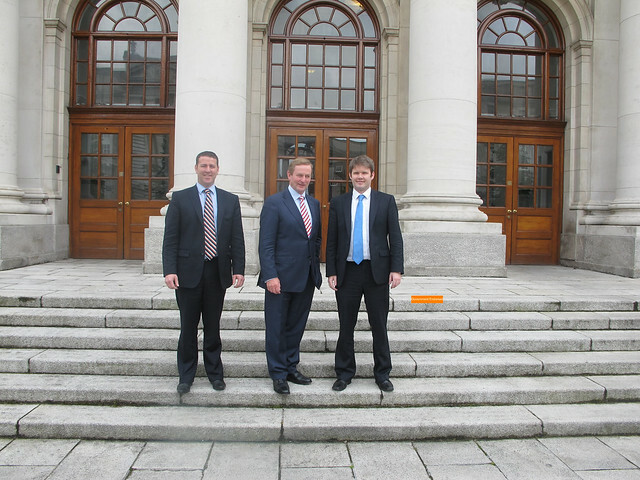 UCD Smurfit MBA alum goes from strength to strength! “A break-through contract for Dublin start-up Ultan Technologies will see the company work with the Sustainable Energy Authority of Ireland to help public authorities around the country manage their energy use. Ultan’s founder, Cathal Brady (MBA 2004), valued the three-year deal at €300,000 or more to supply a version of the web based technology it has developed to monitor and manage utility devices and sensors,. A software developer by trade, Brady established Ultan Technologies in early 2011 in Dublin’s Docklands Innovation Park. The idea behind the company’s web-based software is to allow utility companies to bill and manage their customers more easily and efficiently. “We develop products that work with any device, meter or sensor to take readings from them and put them up on the cloud, allowing people to monitor usage, set alerts or manage the device, report on the various readings and compare them to historical or external readings,” said Brady. I have recently started a job with a small company called one2edit . We are using the methods described by Personal Kanban, and the tools at LeankitKanban.com in order to organise our tasks and time. It is part of the “agile” workflow used by so many software organisations.I am finding it to be incredibly useful on many levels. For starters, a core concept of Kanban is that there should be “information radiators”, meaning that there should be an easy way to see what is going on at any moment, without the need to go digging for any information. A Kanban board will do this by default. At a glance, it is possible to see what a person is doing at any time, what is on hold, why it is on hold, what still needs to be done, and what is important. Yes, a Kanban board can look quite full of sticky notes, but the organisation of those notes has meaning, which users can interpret quickly and easily. As a user, I can use this radiation of information to show both my co-workers and my bosses exactly what it is that I’m doing at any given point. It also allows them to check if the next item they wish to add to my “to-do list” is more or less important than what I am working on right now. If it is less important, then they will not mind if I don’t get working on it right away. In other words, it makes it far easier for me to say, “I have to put that on hold right now, but I will get to it” because they see that I have a system in place – a system that will allow me to tackle every task without forgetting any. This concept is, to quote Jim and Tonianne’s (very informative and well-written) book, “limiting your work in progress” (WIP). This limitation of the number of tasks that one is working on at any given moment is critical to working effectively. John Medina’s book, “Brain Rules”, also mentions how the human brain physically cannot multitask effectively. Multitasking is an inherently inefficient way of working. Kanban seeks to rectify this by allowing a person to concentrate on fewer tasks at a time, unlike the “to-do list”, which just throws every task into the “doing” pile at once. The Kanban board then allows all others to see what is one one’s plate at any time, demonstrating that one is not slacking off. Beyond this information radiation, it is both mentally and physically satisfying to see one’s tasks go from the backlog, to “ready”, to “in process” and then to “done”. Each time a task is moved to “done”, the brain releases a bit of reward, which is motivation for doing more. Furthermore, even the number of tasks doesn’t seem so overwhelming when there’s a system in place and one can see the tasks getting done. Finally, as a recent MBA graduate who was job-hunting for a few months, every interview I did asked about previous achievements. A CV should also have these achievements listed in order to attract employers. In other words, I should have been taking note of all my measurable achievements over my working life in order to use them in the future. Moreover, it is vital when filling out an annual review form to have a list one’s achievements for the year. Kanban can help with this. Everything in the “done” column of a Kanban board is something that can be pointed to along with the phrase, “I did this”. It is not necessary for one to create a special document and remember to update it regularly, if the collation of completed tasks is already part of one’s daily process. Of course, some of the tasks will be small and not relevant or worth mentioning on a CV. But even these small tasks usually serve as reminders of the larger project upon which we worked. This is also a reason why I am using an online tool for my Kanban board alongside my office whiteboard – I won’t have to trawl through physical post-it notes in order to see my achievements.